The racing world is already all abuzz about the 100th Indy 500 race, which is scheduled to take place May 29. Although the first Indy 500 took place in 1911, the contest was not held in 1917 and 1918 due to World War I and was also suspended between 1942-1945 due to World War II. These gaps in the history of the event eliminated six races, so 2016 will be the centennial. The 2016 race also comes five years after the Indianapolis Motor Speedway started celebrating what it calls its Centennial Era. That three-year-long program highlighted the 100th anniversary of the opening of the circuit in 1909 and the 100th anniversary of the first Indy 500, which was held in 1911. The 100th race will kick off on Friday, May 27. It will start with the legendary rock band Journey presenting a concert that will be free with Miller Lite Carb Day admission of $30. Race fans wanting the closest access to the concert stage can purchase a $20 upgrade to the Miller Lite Concert Pit. Prices will increase closer to the event, so it pays to order tickets early. The Speedway says that VIP viewing options and packages will be announced at a later date. 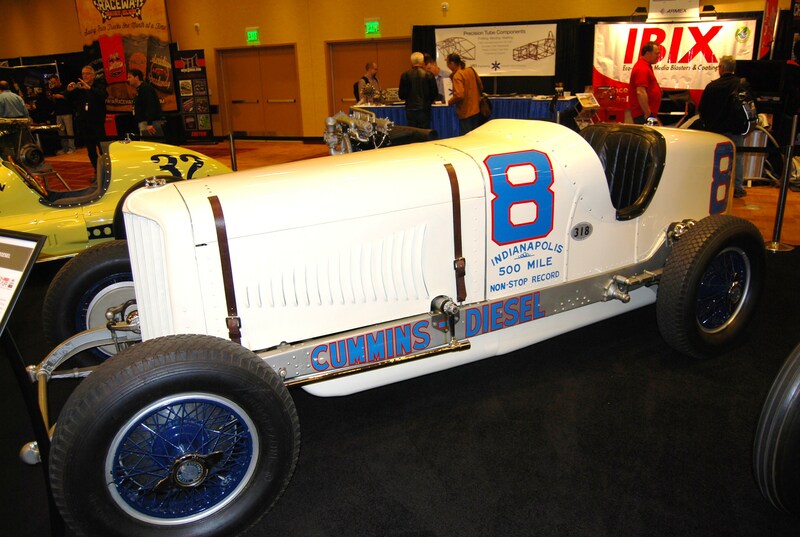 In a presentation called “Evolution of the Indy Car: An Exhibition of Speed” that Speedway’s Hall of Fame museum showcased six significant Indianapolis racing cars from 1914 (Sunbeam), 1931 (Cummins Duesenberg Diesel Car), 1938 (Sampson 16-Cylinder Special), 1967 (Dean Van Lines Brawner Hawk), 1984 (Texaco Star March/Cosworth) and 2000 (Pennzoil Panther Dalara). Also, as part of its PRI Show promotion, the Hall of Fame hosted an appearance of the famous Borg Warner trophy at its booth in the convention center, as well as a public interview of driver Bobby Unser. The legendary racer talked about many of the drivers he had competed against in his career and gave many humorous insights on Indy car racing history that the crowd enjoyed.